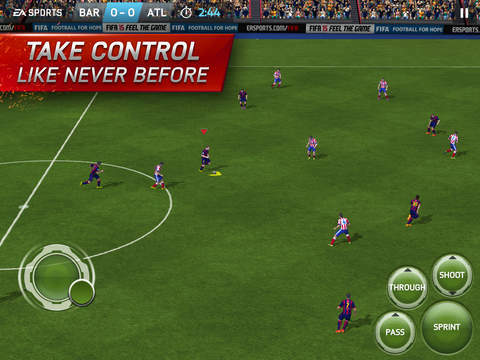 EA Sports’ much awaited FIFA 15 Ultimate Team game for iPhone, iPad and iPod touch has been released in the App Store and is now available for download. The game builds up on the previous version allowing users to build their own teams and compete with others online. You can earn points to buy and trade big name stars for your team and participate in tournaments. The game that follows the fremium model brings over 10,000 licensed players and 500 teams. 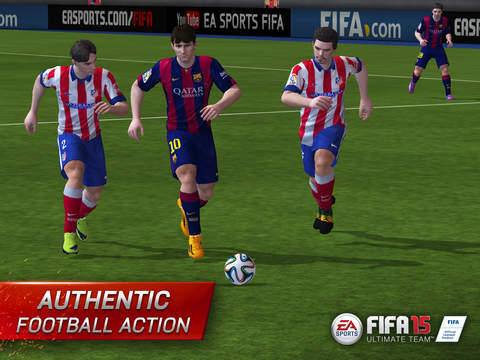 As far as gameplay goes FIFA 15 offers better graphics than FIFA 14 and on-screen controls have been refined to make the user experience better. When trying the game I found myself to be in more control of the ball and the player than the previous release. The menu also looks better in terms of looks and usability. A new feature of the game enables users to perform Quick Simulations, in which users can start a match after setting up a squad to see how everything goes. This makes it possible for players to improve their team and chemistry between team players. Another cool feature of FIFA 15 Ultimate Team is that you can have real world match ups, that means you can play your favorite real world team’s next match right on your device. FIFA 15 is a big game and requires over 1.3GB of free space. You can get it from the App Store for free.